What’s an educated practitioner to do? So, how do you spot fake health news? Signing off and toasting: To spotting and preventing the spread of fake health news! 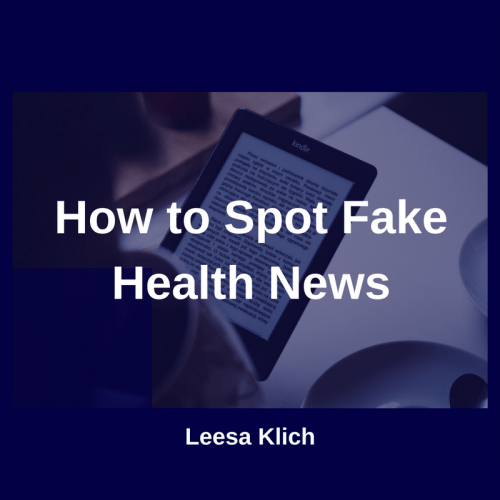 As a practitioner and health writer myself, my main concern is with fake health news. And it’s getting pretty savvy. Those flashy, sensational, or controversial headlines are designed to grab our attention. Leaked information, or whistle-blower stories can erode our trust. And, not only in who is disseminating the information (media), but also who that information is about too. My goal is to help combat the ridiculous amount of fake health news out there. I want to increase intelligent skepticism of health news, as I recently wrote about here and here. I also want to help you be able to respond when your clients ask about the latest headline. I want you to be ultra-credible. I want to join forces with you to improve public health on an epic scale. By recognizing fake health news, and combating it. One blog and social media post at a time. It is a photo of the Canadian and American falls at Niagara. We have the longest border in the world. And there is no military defending it on either side. We don’t agree on everything, but we use discussions and not wars. So, let’s discuss how to spot fake health news. We live in an unprecedented information age. With 24-7 access to the internet, and 76.3 million new blog posts being published. Every. Single. Month. On WordPress alone! We live in a time of fake news and “alternative” facts (a.k.a. mistruths, falsehoods, and downright lies). We just lived through the year that the Oxford dictionary declared the 2016 word of the year to be… Do you know what it was? And, while a lot of the “post-truth” references are political, it has some serious implications in terms of communicating health and science. On a good note, Google announced its intention to show if certain posts have been fact-checked. Search results are supposed to start showing a little “fact checked” label under them. I haven’t seen any yet, have you? Facebook has created a policy to help curb the spread of fake news. Even if we do identify what information is real or fake, and curb its spread, there is still the issue of algorithms. They show you web and social media posts based on ones you’ve previously liked. They create an “information bubble” around us where we stop seeing different perspectives. Where we get regular confirmation that what we “like” is true. The bottom line is that there hasn’t been so much information readily and instantly available in the history of the world. And this information comes in varying degrees of quality. Just about all of it is biased to some extent. And it has either strong, weak, misunderstood, or completely misrepresented evidence. 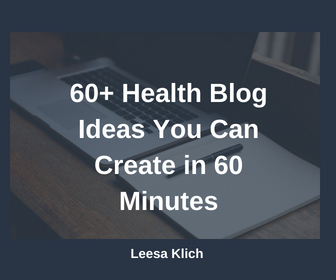 All of this good and bad health information has the ability to affect clients, blog audiences, and public health in general. Ultimately, everyone online can indirectly be affected through grassroots health practitioners like you and I. This is why it’s so important to me and why I want to join forces with you. People see and hear new health information every day. Many of them act on it. Some of the information is false. And making health decisions based on fake news can be dangerous. I’ll tell you a true story in a second. Let me tell you a few reasons why I care. Why I want you to have and spread the best information to your clients and audience. It truly is because I want to join forces with you to improve public health on an epic scale. An older person I know has many conditions. He is taking many medications. Years ago I warned him not to eat grapefruit or drink grapefruit juice. It really doesn’t matter how I know; the point is that it’s correct (it’s not fake health news). And I care about him. So, what does he do? Goes to look it up himself. But, what did he find? Why do I care about this? Why should you or anyone else care? Grapefruit (and limes, pomelo oranges, and seville oranges) contain a type of compound called a “furanocoumarin.” This compound inhibits an enzyme (CYP 3A4 for #healthnerds like me) that metabolizes dozens of medications. In his case it’s a blood pressure medication. Can you see how having 32+% higher medication levels in your blood can be dangerous, and why fake health news is a public health issue? This is such a simple thing to prevent. A simple and unified public health message to ditch the grapefruit if you’re taking certain medications (85 meds and counting). Enjoy other citrus fruit (not limes, pomello oranges or seville oranges). Let’s not allow incorrect information to negatively affect public health. Help me spread the word on this one, please. Books, blogs, and documentaries are essentially a collection of stories (also known as “anecdotes“) and “expert opinions.” Most don’t have rigorous review (or even much fact checking) before publication. However, many people who read or watch these believe they’re credible, that the experts are correct, and that the information applies to their unique health situation. So, they go ahead and act on the information and make decisions to change something they’re doing. Sometimes this is great (like getting people to eat more vegetables). Sometimes this is dangerous (like drinking grapefruit juice with meds). Want to know why “expert opinion” is not considered to be high quality source of information, especially when it comes to health and science? Here is my favourite infographic of all time. You’ll see expert opinion is ranked even lower than animal or cell studies. The fallibility of expert opinion aside, there is another reason why books, blogs, and documentaries based on expert opinion aren’t reliable. It’s called “medical disclaimers.” They’re used to disclaim liability from anyone who uses their information and is harmed by it. Say, by drinking grapefruit juice 2 hours after taking medication. Licenses to practice, codes of ethics, and medical liability insurance can be prohibitive. They can stop health professionals from making certain recommendations to their clients/patients. But, not if you share them in a book or blog or documentary with a good medical disclaimer. Many experts use these avenues to say things that they may not be able to in a professional relationship with a patient or client. And certainly they can say things without needing their peers or others to weigh in on the quality of the information. The information is true and high enough quality to be referenced. Yes, there is SO MUCH conflicting health information out there. And no education is complete upon graduation. Not even medical school. Sure, helping people drink more water, eat more vegetables, or cook from scratch are no-brainer great things to help clients do more of. But, if you’re digging down into helping people with certain conditions you may need to learn a lot more. This is why spotting fake health news is so important. Keep learning the new and better information. Be intelligently skeptical. Also, notice when some piece of information really gets you frustrated. If you start feeling defensive, take a step back. New information is NOT about you, it’s about new information. And I’m all for intelligent review of health information. Here is a quick summary of a few studies and how they were reported in the media/online. You’ll see the difference between what the studies concluded, versus what the headlines said. Here is my second-most favourite infographic of all time. It’s a Rough Guide to Spotting Bad Science. It includes a few points on how to spot bad media coverage (see #1, 2 & 10). Many of the other points refer to spotting if the study itself wasn’t awesome. When it comes to nutrition in particular, there are lots of reasons for a plethora of conflicting information. Particularly because it’s extremely difficult to do randomized controlled trials and control exactly how much of what foods people eat. This has been eloquently explained by Julia Belluz at Vox, John Berardi at Precision Nutrition, Darya Rose at Summer Tomato, and Sarah Ballantyne at The Paleo Mom. You can download my list of credible health resources. I’ve also included links to these and more articles explaining why health science seems conflicting, particularly nutrition science. And if you’re so inclined to go straight to the science, I’ve included some PubMed tips too. When you research for your own blog posts or client recommendations, here’s my method on how to do it both CREDIBLY and EFFICIENTLY. Do they cite mostly peer-reviewed scientific articles? Do they cite corporations that make the products they are affiliated with? Do they cite like-minded experts? Do they cite no one because of their grandiose expertise? What products or programs are for sale on the site. Not just ads, but also products and services that they may have a financial investment in. Are their posts sponsored? Do they promote one particular brand? Does the website try to be controversial? Are their headlines “clickbait?” Do they purposefully go against common recommendations to stand out and become known? I have to say that I’ve been highly disappointed in a few different new books that purpot to be the new way of medicine. They claim to be science-based and have a bunch of PhDs and MDs etc. as spokespeople. Some “facts” they mention in their new book references textbooks that are 20 years old. They didn’t even fact-check or search for primary scientific references! And I know they’re not facts, because after hearing these claims in the past, I looked up the research and didn’t find anything to support it. Nope, not even fancy degrees or years of experience stop me from changing my mind to new (credible) information. Last year I completely changed my mind on gut microbes because of new information that just came out. Recent research at MIT confirmed that fake news spreads faster and farther than the truth. Evokes feelings of fear, disgust, & surprise. The “less spreadable” truth evokes feelings of anticipation, trust, joy, & sadness. Will you join forces with me to spread credible health information to your clients, audience, and the world? Grapefruit and juice should not be taken with medications. SPOILER ALERT FROM WHEN I CHANGED MY MIND: There are NOT 10x as many gut microbes as human cells, the number of human and gut microbe cells is about the same. What do you think? How do you spot fake health news? Did I miss any other helpful resources? Do you have any comments or questions? (2) Lundahl J1, Regårdh CG, Edgar B, Johnsson G. (1995). Relationship between time of intake of grapefruit juice and its effect on pharmacokinetics and pharmacodynamics of felodipine in healthy subjects. Eur J Clin Pharmacol. 49(1-2):61-7.